One way to help your children be successful in school and organized at home is to create routines. This is a guide about household routines for school age children. At this point, pretty much everyone's kids are back to school, with the resulting chaos and confusion. My boys are teenagers now but need structure more than ever. The classes are getting harder and there are so many daily distractions, both with electronics and friends. Add on a sport, extracurricular activity or a job, and it will be midterms before we know it. Over the years, I have learned a couple of tricks to keep my kids healthy, well-fed and rested so they can put their full attention toward learning. Here is what I do. It is best to start enforcing an earlier bedtime a week or two before school starts. Children need 8-10 hours of sleep and they say that teens need more than younger kids. As my oldest needs to leave for school by 7:30 AM, he gets up about 6:30 to give time for a shower and breakfast. That means he should be in bed no later than 10:30, as long as he goes right to sleep. To ensure they don't stay up late, we have a no electronics rule on school nights after dinner. My youngest is not allowed to have his phone or computer in his room at night and my oldest is not allowed to text after bedtime. If they cannot sleep, they are allowed to write, draw or read quietly in their rooms. If they seem extra tired in the mornings, I will start to double check that they are asleep before I go to bed. It really depends on your child. We have had great success with showers in the morning right after the alarm goes off. 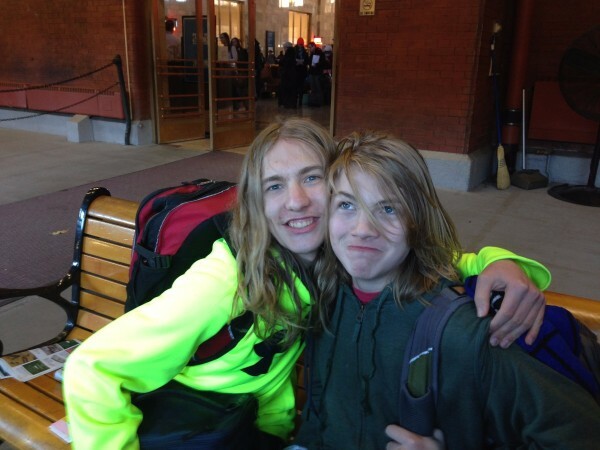 Both of my sons have long hair and part of our agreement is that they keep it clean and neat. The morning shower routine helps them remember to put on fresh clothes and deodorant, and time to brush their hair and teeth. I make sure the oldest is in the shower right away and then wake up my youngest. Some families like to do evening showers to avoid the rush in the morning but I think it helps my boys wake up and mentally get ready for the day. Proper nutrition is so important for growing bodies and minds. It's easy to expect them to be old enough to feed themselves but it doesn't always work out that way. I try to make sure that both teens are well fed with a variety of different foods throughout the day. Here is how I handle mealtimes. While my boys are in the shower, my husband and I will often make breakfast for them. It is usually something with protein and eggs; scrambles, frittata, breakfast burritos, omelets. Sometimes we eat breakfast as a family and other times, the meals are made one at a time. When we are too busy to cook, the boys can eat oatmeal, cereal or yogurt. In a pinch, there is a hot breakfast offered in the school cafeteria, which has saved the day more than once. I encourage the boys to pack a lunch a couple of times a week, for variety and to save money. The rest of the time, they go to the cafeteria. Although there are daily options, both of my boys generally get the same things; pizza or burgers. I ask them about their choices occasionally and urge them to choose fruits and veggies as well. I try to have a healthy snack ready for them as soon as they get home from school. I have a fully stocked fruit bowl readily accessible as well as whole grain granola bars, string cheese and other kid favorites. We rarely have soda or sweets unless it is a special occasion. On the days when they have sports, I make sure they are drinking plenty of water as well. Dinnertime is somewhat later than I would prefer as it needs to fit in around sports. We often eat around 7:30. I make soups and stews, stir-fry or casseroles. One son is a vegetarian so I will sometimes make two different meals at the same time or trade off days with a meat main course. It is a little bit of a challenge but our family eats healthier because of it, even my little carnivore. When my son was a freshman, he had a very difficult time with the homework. He would not understand the assignments or would not write it down clearly. It was a big jump from his last school. He got very behind and wound up with terrible grades the first semester. Now, we go over the classes together and discuss the homework requirements every day. If needed, I will contact the teachers and get their help. If you can start the kids off on the right foot, usually the problem will correct itself. I usually have the boys do homework on the kitchen table, while having their afternoon snack. That way, I can putter in the kitchen or living room and still be on hand to assist them, if needed. The assisting is getting harder every year so I use Google to help me understand whatever they are working on. There are wonderful math sites for tutors or parents. And, when the homework is done, be sure they put it back in their backpack to take to school tomorrow. Some missing assignments never made it back to school, despite being completed. Both of my kids walk or bike to school most days. They both enjoy this freedom. The walk is another chance to mentally prepare for the day ahead as well as get the "wiggles' out, as we called it when they were little. We drive them when the weather gets bad or if there is a need. Afternoons can be busy for our family. It is easy to overbook children, especially when there are so many competing interests and options. My sons are both in sports; soccer, taekwondo and track. We try to keep the schedule as light as possible so that it doesn't interfere with home time. However, my boys sleep better on the days where they had a good workout and their stress levels seem better too. We all just need to find the right balance for our situation and family. What are some ideas your family uses to add structure for your school age kids? Post them in the feedback below. Here's hoping for a successful school year! Yours seems to be full, rich and rewarding life. You have my respect and admiration. But, at my age, I am not the least bit envious. Do you ever get any rest?